Notice how “BEER” featured heavily in this “training session” which also appeared to be sponsored by Primark! Good luck for the event in two weeks time! Raising money for McMillan Nurses and Alzheimer’s Research. The cyclists will be having a training session on the turbo trainers. Enjoy a drink in the warm sunshine whilst urging on the cyclists to stay calm and keep on pedalling and supporting the chosen charities. Sometime back in October the gauntlet was laid down and the challenge accepted and a group of middle aged folk (and one youngster) dusted down their bikes and probably in hindsight in a moment of madness decided to cycle 220 miles from the highest pub to the lowest pub in Britain, the Tan Hill Inn in North Yorkshire to the Admiral Wells in Holme (and “no” it isn’t downhill all the way). The challenge will take place over 3 days 3rd-5th May finally arriving back at the Addison to hopefully a fanfare. 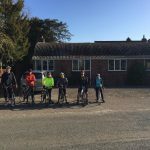 Training is in full flow and we are to be seen out on our bikes in the surrounding countryside and obviously there is need to refuel with a well-deserved coffee and cake stop. This entry was posted in General and tagged Alzheimer Research, Glatton, McMillan Nurses. Bookmark the permalink.